In Holland, we have a famous vegan company called 'the Dutch Weedburger'. The 'weed' in their burgers is seaweed and it's totally delicious. Be sure to visit their restaurant if you are ever in Amsterdam. 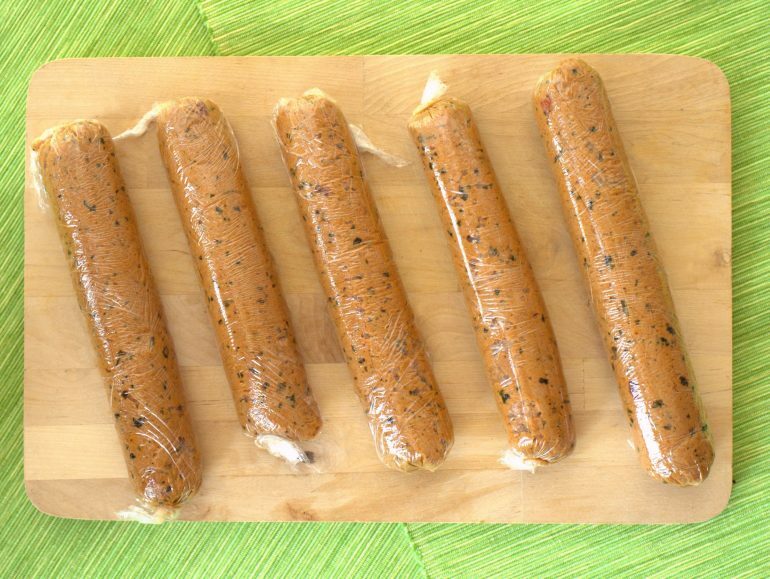 Recently they also started making seitan sausages with seaweed in them. It sounds weird, but the seaweed adds a delicious savory note, without making the sausages overly fishy. I liked it so much that I added some seaweed to my own sausages and it turned out really nicely. However, if you don't have seaweed or don't like it, you can leave it out and the sausages will still taste really good. These sausages are more moist and tender than your average seitan sausage. When you make the dough, it may seem too wet, bet that's exactly how it's supposed to be. After steaming and cooling in the fridge they will be firm but still nice and juicy. They taste best fried up in a little oil. Eat them in stews, salads or sandwiches. In a bowl, mix the wheat gluten with the soy flour, spices, seaweed and salt. Add the water, oil, soy sauce, miso and ketchup. Mix with a spoon and later with your hands until a wet dough forms. Prepare 3 to 5 sheets of microwave safe plastic wrap or aluminium foil and place a sausage shaped piece of dough on each sheet. Roll up the sheets tightly so the sausages snap into shape and twist the ends closed like a tootsie role. Bring water to a boil in your steamer pot (or improvise a steamer with a regular pot and a colander). Steam smaller sausages for 30 minutes and larger ones for 45 minutes until they are firm to the touch. Let the sausages cool down and firm up more. They keep about 4 days in the fridge or 3 months in the freezer. You can eat them as is, but they taste a lot nicer when browned in a little oil. I just today came across your web site and find it really interesting and helpful. I particularly enjoyed reading your balanced review of What the Health. Is there a newsletter or English Facebook or Pinterest site to follow you? Thanks for sharing. Martine I feel you should go back to the drawing board on these sausages. I added a lot more wakame shredded seaweed and 2T heaping of gluten and they were still soggy when I rolled them In the steamer now for 45 minutes. Hi Bob, how did the sausages turn out for you? The dough is supposed to be quite soggy, because that's the secret to making a moist sausage. The dough may seem much too wet, but in my experience it will firm up during steaming just fine. Vital wheat gluten can vary a bit in its ability to absorb water though, so if the dough is really too wet, you can fix it with a little extra gluten flour.